Decrees on the recycling of different packages come all the way from the EU. Finland uses a deposit-based return system for beverage packages, which enables the efficient collection of packages for recycling. A beverage packaging tax of EUR 0.51 per litre is collected for the packages of certain alcoholic beverages and soft drinks, but becoming a member of an approved and operational return system or organising a new return system provides an exemption from the tax. The Finnish Government has issued a decree on the recycling objectives of return systems and the minimum values of different beverage package deposits. 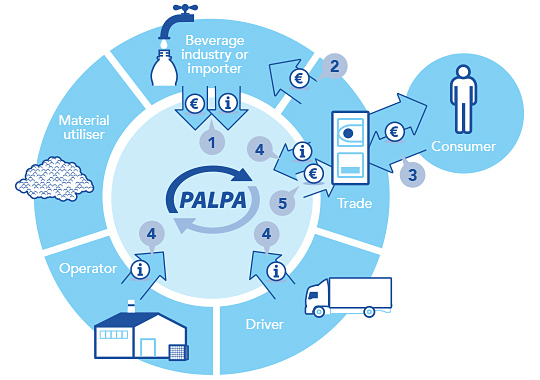 In practice, most of beverage manufacturers and importers are members of return systems managed by Suomen Palautuspakkaus Oy, hereinafter Palpa. 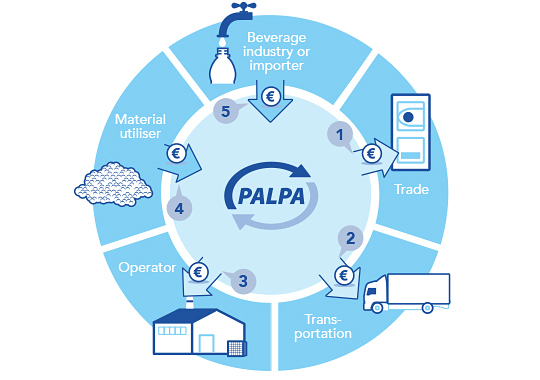 By becoming members of Palpa’s return systems, beverage manufacturers and importers are exempted from the beverage packaging tax. The deposits of the packages encourage consumers to return empty beverage packages for recycling. This prevents the packages from ending up in nature or in mixed waste. The deposit is a good incentive for recycling. Other aspects, such as the location of the nearest return point and the functionality of the reverse vending machines, affect the will to recycle. Habits and attitudes also have an effect: In Finland, returning bottles and cans is learned in childhood, and it is considered important. Therefore, the recycling rates of beverage packages in Finland are among the best in the world. When the materials of beverage packages are efficiently recycled, we are able to conserve natural resources and keep our environment cleaner. When, for instance, an aluminium can is made from recycled aluminium cans, the production only requires 5% of the amount of energy consumed in making a can from new materials. The recycling materials acquired from PET plastic bottles and glass bottles are used for the manufacturing of new bottles and other products in many different sectors of industry. 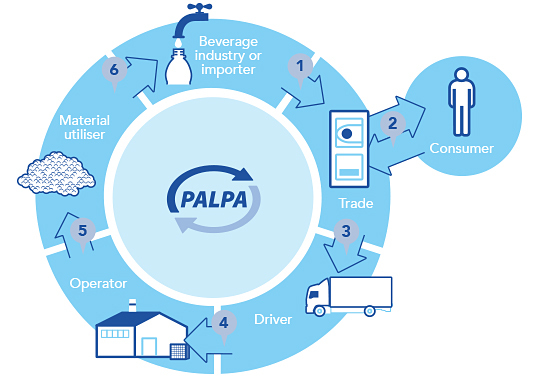 PALPA manages and develops return systems. The manufacturers and importers of beverages fund return systems through different types of payments. Consumers return deposit packages to stores and kiosks. Hotels, restaurants, offices, schools and different event organisers return deposit packages through beverage suppliers. Stores receive deposit packages and pay the deposit to the consumer. Transport companies deliver empty beverage packages to the operators. Operators calculate the plastic bottles and cans not returned via machines and bale the materials for transport. The glass bottles returned from return points are picked from operators for transportation. Those utilizing the materials sort and process the materials for reuse. Most of the materials end up reused by the beverage industry as new beverage packages. WHO PAYS FOR THE RECYCLING OF BEVERAGE PACKAGES? The manufacturers and importers of beverage packages pay a membership fee and package-specific recycling fees. The fees collected from the members are used to cover the expenses of the return systems. The expenses of recycling beverage packages are the result of i.e. logistics, the transportation of the packages in different stages of the recycling chain, the compensations paid to the return points, and the processing of materials, among other things. PALPA, the administrator of the system, is a non-profit company. The consumer identifies a can or plastic bottle belonging to a deposit-based return system of PALPA on the basis of the deposit marking on the package. The marking also indicated the value of the deposit. All deposit glass bottles do not have a marking. In these situations, the deposit can be checked from the purchase receipt, the shelf marking in the store, or using the tool for checking the deposit of a product found in PALPA website. A reverse vending machine identifies a deposit bottle or can by comparing its barcode and shape to the information in the reverse vending machine’s register. To ensure a successful identification, the deposit package should be intact and the barcode should be readable. A correct identification of the package is important in order to ensure that the person returning the package will receive the correct amount of deposit. The reverse vending machine sorts the packages during the returning event. The better the recycled materials can be sorted immediately in the early stages of the recycling process, the less time and money is required later for cleaning and sorting the materials. How does the recycling of beverage packages work abroad? In other Nordic Countries, beverage packages are recycled with the help of a national and general deposit-based system, as in Finland. The recycling rates, i.e. the share of returned packages in relation to the number of sold packages, are very high in the Nordic Countries. Other options for recycling beverage packages include individual deposit systems of store chains, optional sorting as with other household waste, and sorting at waste treatment plants.